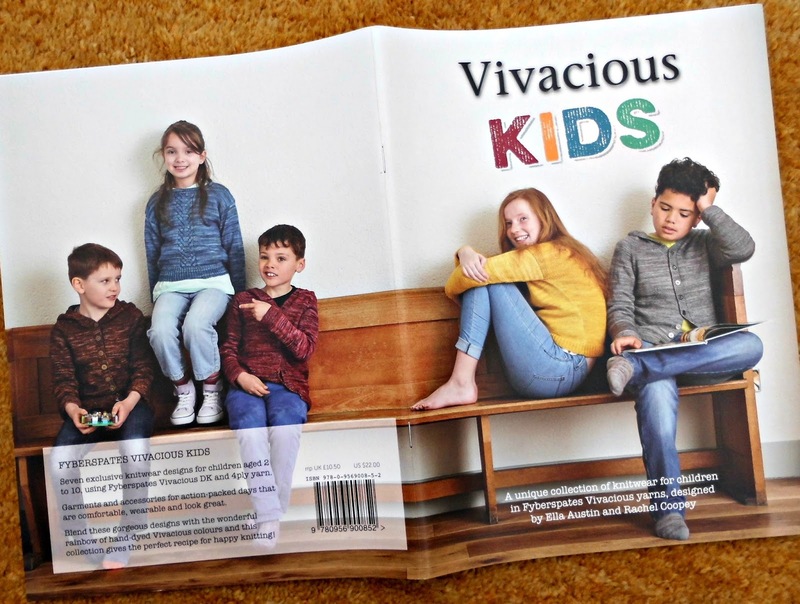 Fyberspates Vivacious Kids pattern book review and giveaway! 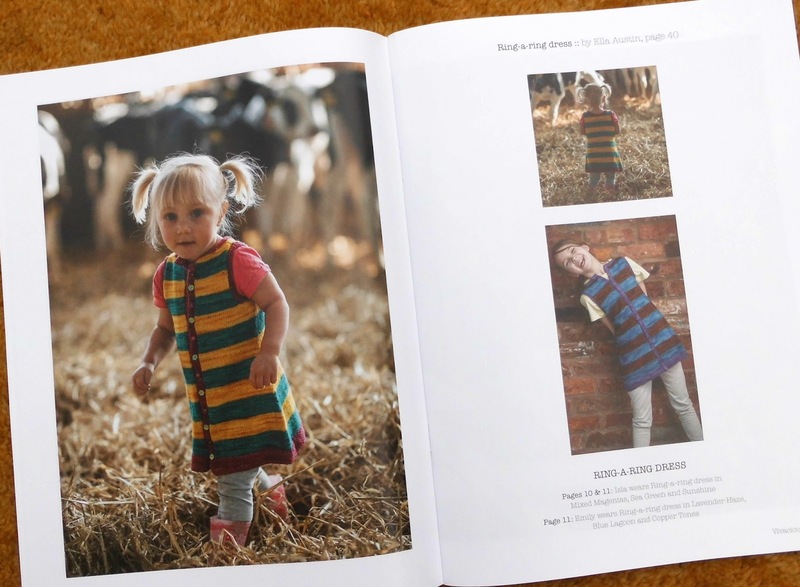 Anybody who knits will know how many patterns are available to knitters, whether as paper copies at yarn shops, downloads through blogs like mine or on websites like Ravelry. Most of these patterns are single copies which is usually fine as that's often all you want to knit - but if there's one thing that I do like, it's a a pattern collection. 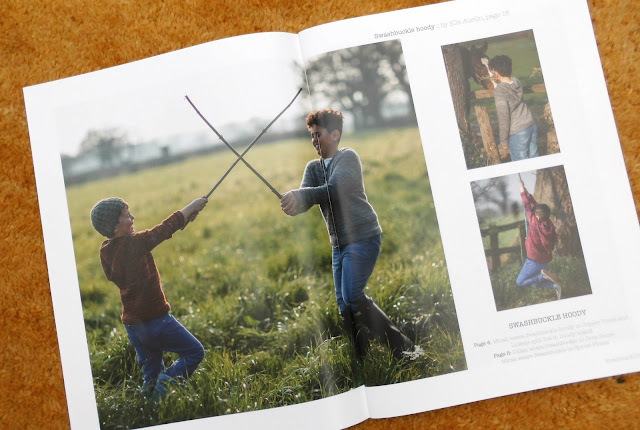 I've got a few books of patterns - Kaffe Fasset (one of my earliest aquisitions), Debbie Bliss and Alice Starmore amongst others and what I love about them most is the photography. I love to see people wearing the designs and looking as if they're wearing them properly, not just posing for the camera. 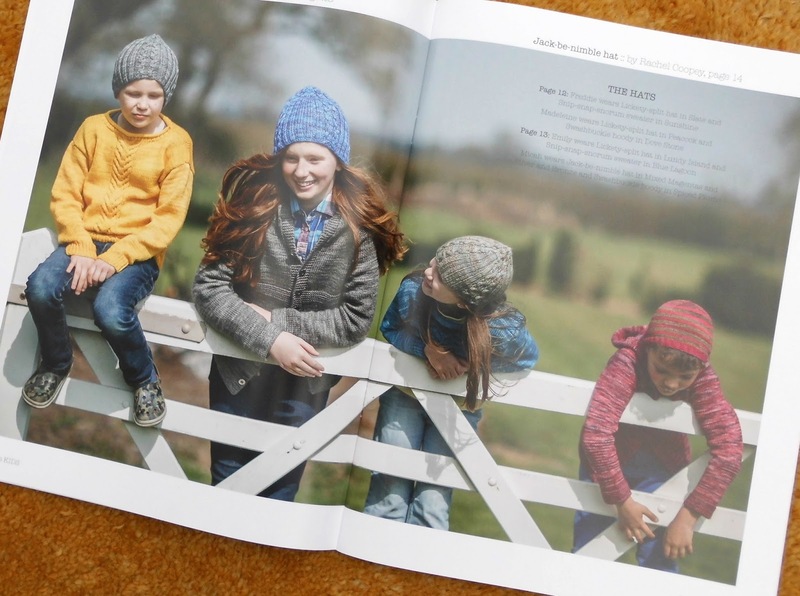 So when I was asked if I would like to review the new Fyberspates Vivacious yarn collection, Vivacious Kids, I was delighted to see that all of the jumpers, hats, socks and mittens are being worn by children who are doing anything but just posing. There are seven patterns in the book, suitable for both boys and girls from age 2 to 10 - a hoody cardigan, a cabled sweater, a stripy dress, two hats mittens and socks - all knitted in the gorgeous Fyberspates Vivacious DK and 4ply colours. Who wouldn't want to knit this dress for their tiny tot? I'd have loved to have knitted this for my girls! I think what I like most about these patterns is that they are designed for children to wear whilst going outside to do what children do best - playing! Ella Austin's sweater, cardigan and dress are comfortably styled so that they will not restrict activity, and Rachel Coopey's hats, mitts and socks are practical designs which won't get pulled off at the first opportunity (not that socks would hopefully be pulled off anyway unless playing indoors, but small daughter doesn't believe in keeping hats or mitts on any longer than strictly necessary even in freezing temperatures!). I've already been working out how to enlarge these socks for my bigger feet! 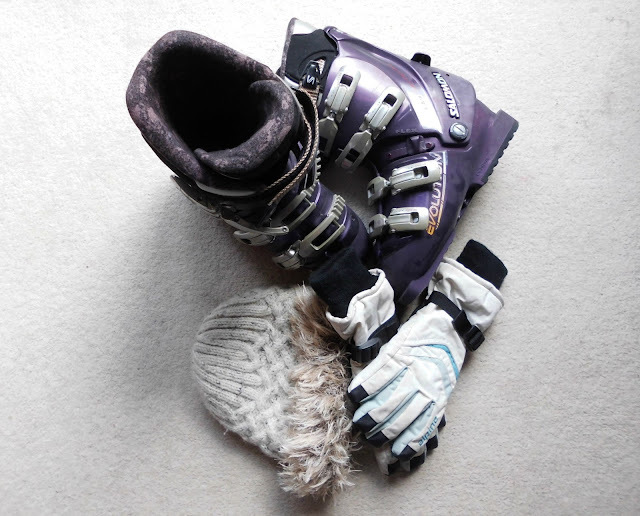 As well as the patterns, there are useful sections on sizing, techniques such as grafting, blocking and finishing, and advice on general care. I love this cheeky smile! I would be happy to make any of these patterns for my daughters. 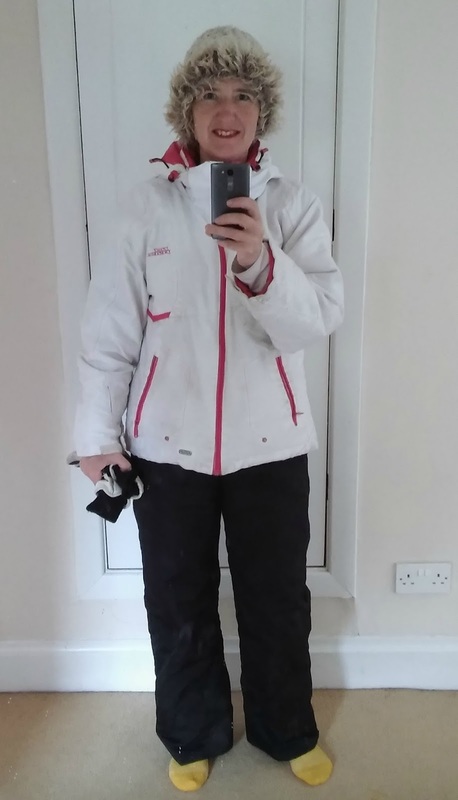 Sadly, big daughter is too big for the sizes now but small daughter has still been known to hang over fences and climb trees, and as I spend a lot of time shouting "Where's your coat?" into thin air as she hurtles outside, it would be good to know that she's wrapped up warm in cosy yarn even if she hasn't got a coat on! 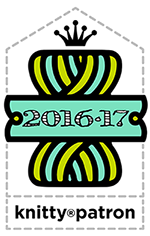 The collection comes in both print and PDF format for those who prefer to download their patterns. The download is easy to manage through Ravelry, and sits happily in your library until you choose to download it to your computer. 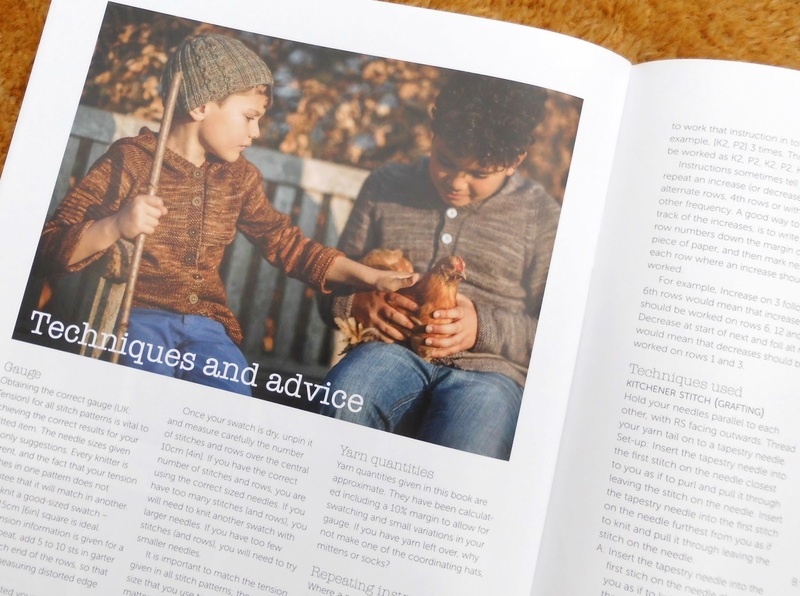 The book version is printed on high quality, glossy paper which really shows up the beautiful colours of the yarn, and purchasing the book also entitles you to a PDF download if you want one. 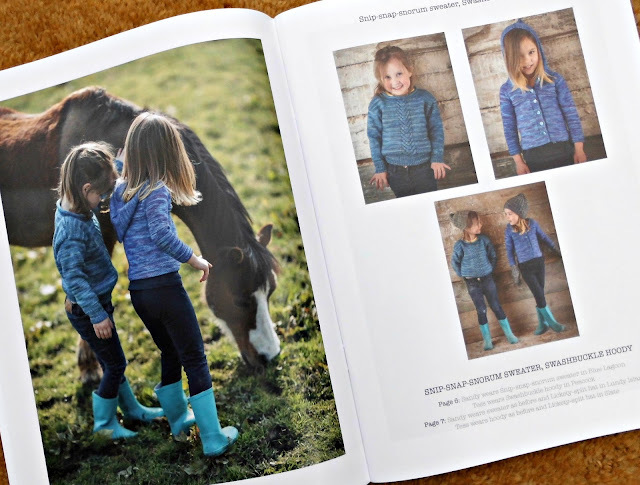 I'm very pleased that Jeni at Fyberspates has kindly given me a PDF copy of the patterns to give away - they're so lovely it would be a shame not to share! 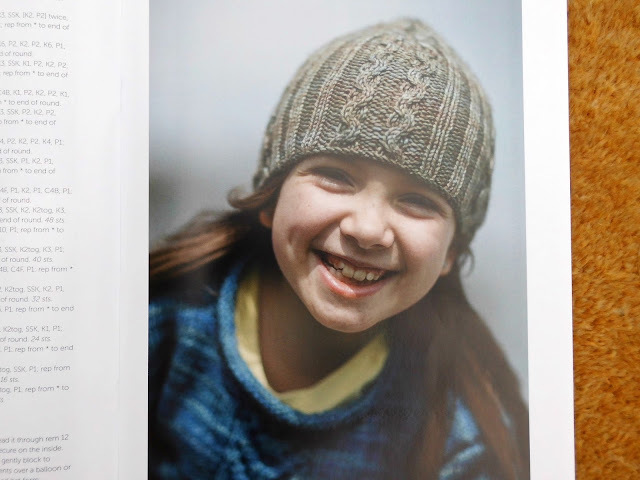 You can view all of the patterns here on the Vivacious Kids Ravelry page. 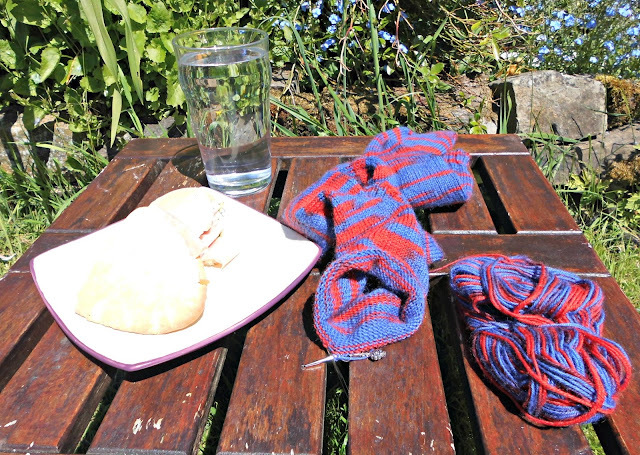 All you need to do to win is leave a comment saying which pattern you would knit and why, along with your Ravelry name so that the ebook can be sent to you, and I'll pick the winner next Monday 6 July at 8.00pm (BST) using the random.org generator so that it's completely fair. 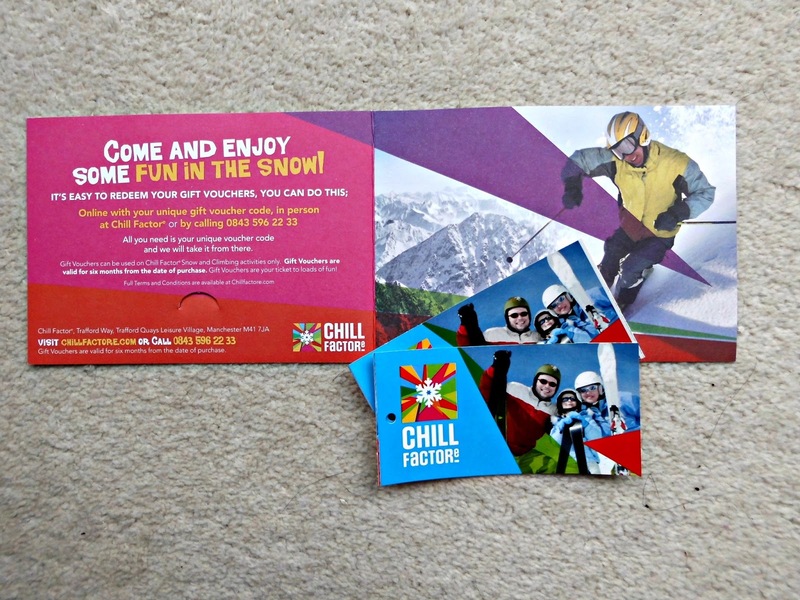 Only one entry per person. 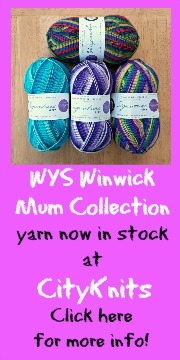 for rrp £10.50/$22.00 and you can also purchase an eBook through Ravelry for $16.00. If you buy a pattern and win the giveaway, Fyberspates will reimburse the cost for you. Don't forget that you will need to click on "add coupon code" in the Ravelry shopping basket before you pay through PayPal. 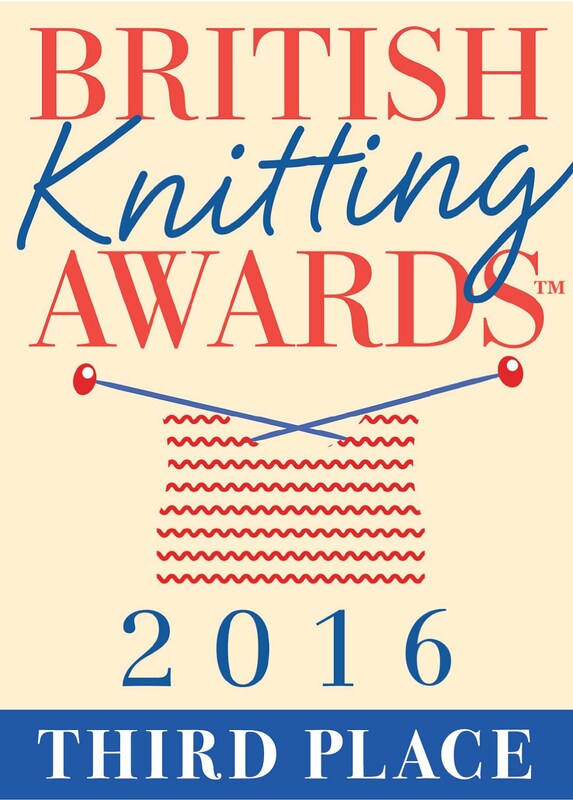 Do let me know if you make any of the patterns - I'd love to know how they turn out! Thanks to Fyberspates for sending me the book and the PDF to review! One of the things about being in the habit of blogging is that you take photographs a lot of the time. Sometimes I will take a picture because I specifically want to remember something, and other times I will take pictures because I think I might want to write about them in the future. The benefit of this is that when you look back through your photo files, you find all kinds of memories that would otherwise have been lost forever. The downside, of course, is that you store hundreds of photos that you might never have a use for! I'm very happy to take part in Five on Friday this week as it has given me a reason to revisit some of the photographs that I've taken over the last week and gives them a place to be shown when otherwise they might have stayed, gathering virtual dust, in a computer file! So here we go! and coral-coloured ones (appropriately named "Coral Reef") which I'm particularly proud of as they were the first ones I grew from seed. I have so many more - "Mrs Perry" (of course! 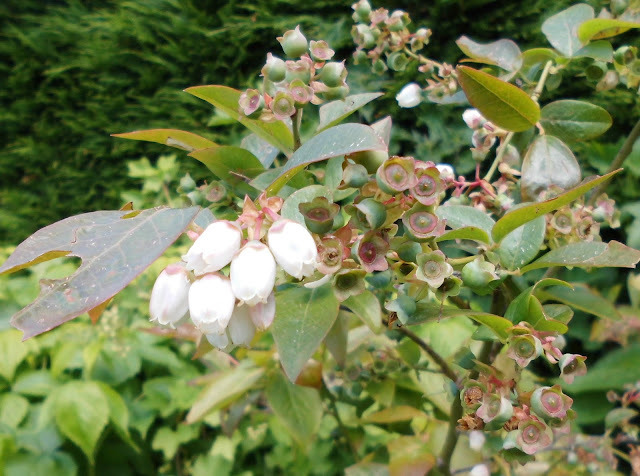 ), "Fruit Punch" and other varieties that I've forgotten the names of, but today I have just shown you five (Ha! Five within five!). 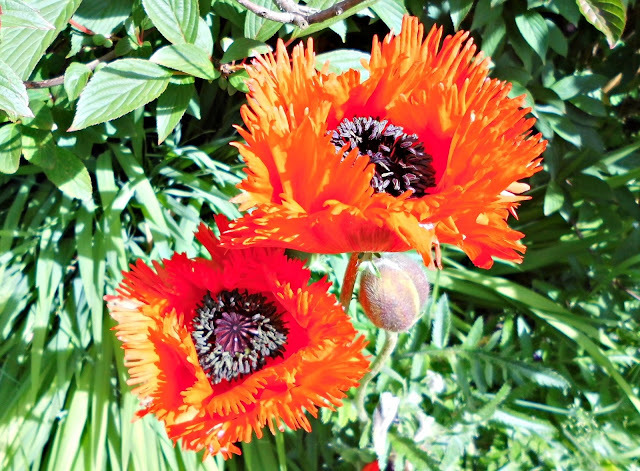 I could quite happily fill my garden with nothing but Oriental poppies, but they only have a relatively short season and there are other plants that I love in the garden too so it's only right to make space for them as well! Two - elderflower cordial. I make this every year, it's such a refreshing drink and I always feel such a sense of achievement to know that I've made it myself. 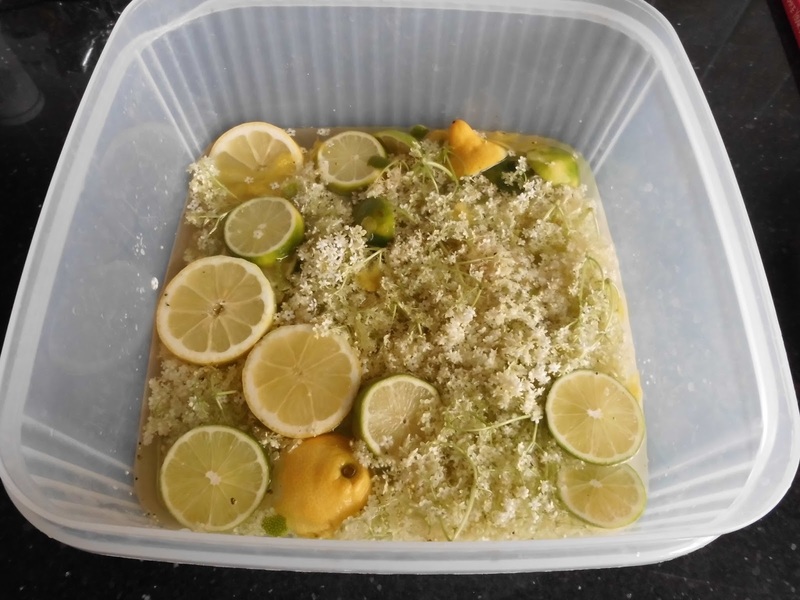 It's terribly easy - elderflower heads, lemons, limes, sugar, water and citric acid all mixed together in a bowl and left overnight. 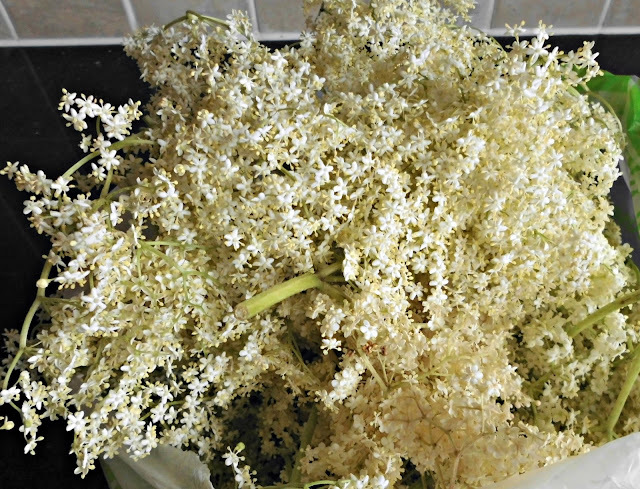 Big daughter and I picked the flower heads today; I was worried that I might have left it a bit late as I've been meaning to do this for a week or so, but this year seems to have been a particularly good year for elderflowers and there was no shortage of blooms - some of them much bigger than I've seen in previous years too! The smell of the ingredients whilst you're preparing the cordial is amazing. 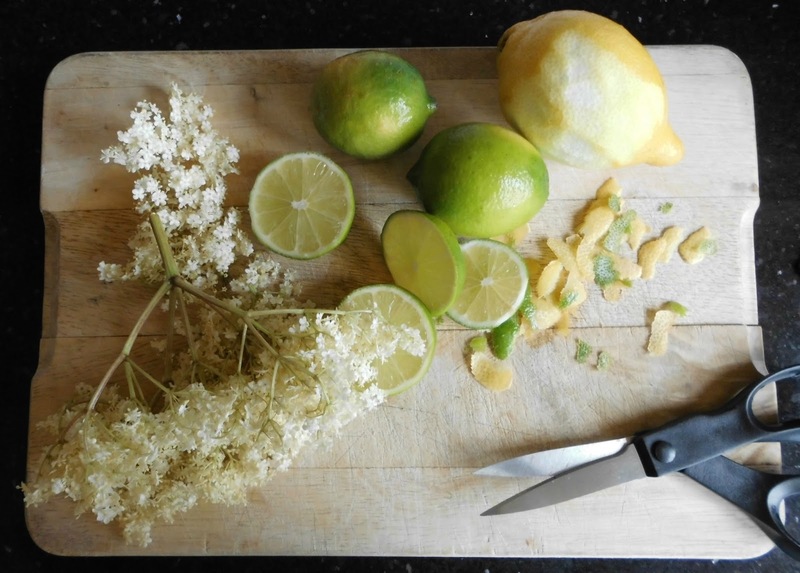 Elderflowers and citrus ... mmm! I think the next big technological thing should be transporting smells across the internet. 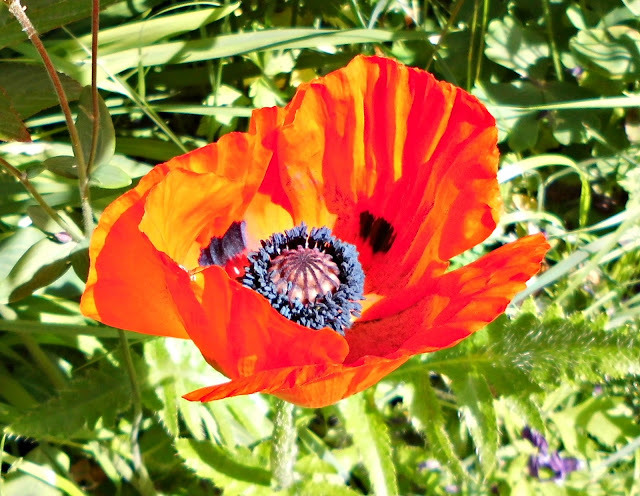 Just think how wonderful that could be - as long as you could only upload nice smells! In less than an hour, my cordial is ready to sit overnight in a cool, dark place and tomorrow I'll be able to strain and bottle it, ready to drink straight away. It doesn't get much easier than that! I've tried a few recipes over the years, but my favourite is the one from this book which has never let me down. I've tried a few of the other recipes in the book too, and they've all been good! 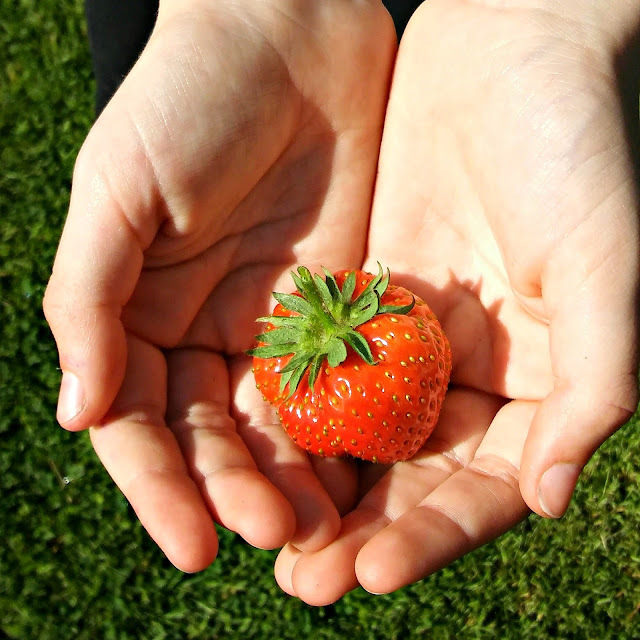 Three - the first strawberry of the year. Back in March of this year, I replaced the strawberry plants that we have with some new ones and the very first fruit was ripe enough to eat. Small daughter made sure that she was on hand to quality-test it and it was deemed to be Very Good. Four - Midsummer. Last Sunday was the longest day of the year (although you'd never know it from the weather in the photograph!). It was also Father's Day and we'd taken ourselves and my Dad out to Chester for a walk along the walls. We couldn't miss the Chester Midsummer Watch parade, which is held on the Saturday and Sunday closest to Midsummer (thank you to Mrs Tigglywinkle for setting me right on the date!) - a spectacular and very noisy parade featuring dragons, devils, unicorns, stags and a pirate ship amongst other parade participants. 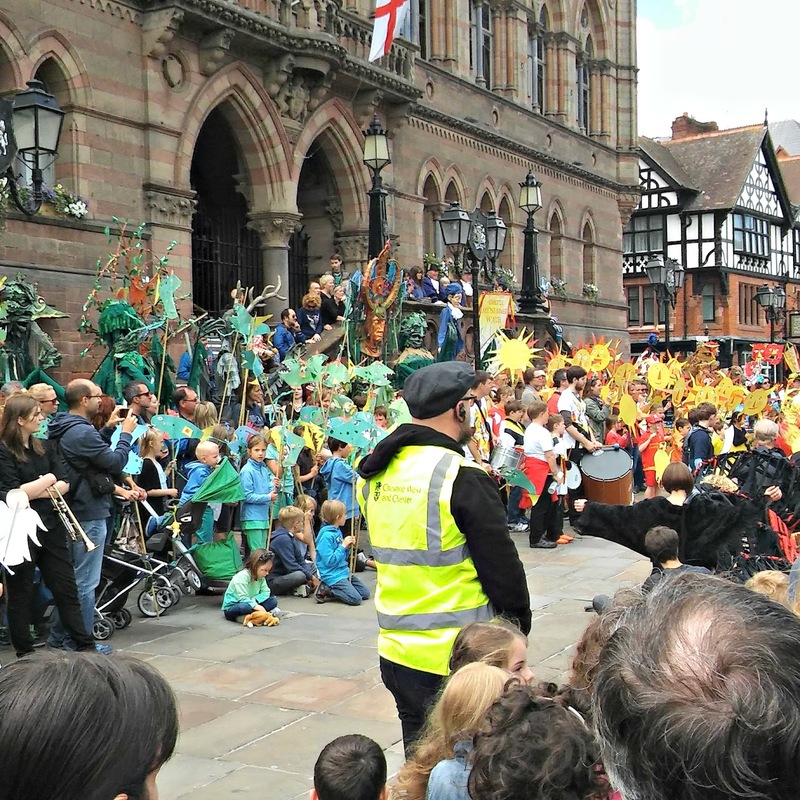 We weren't sure what our dog was going to think about it (he likes a stroll around Chester so we couldn't have left him at home), but he seemed to take it all in his stride and at one point we thought he was going to join the parade himself! Five - new socks. It seems to have taken me an inordinately long time to finish these socks, but what with the Sockalong and university visits, my own knitting has taken a bit of a back seat at the moment. That's the best thing about socks, though; they're so very forgiving if you put them down for a while, especially an easy plain pattern like this one. 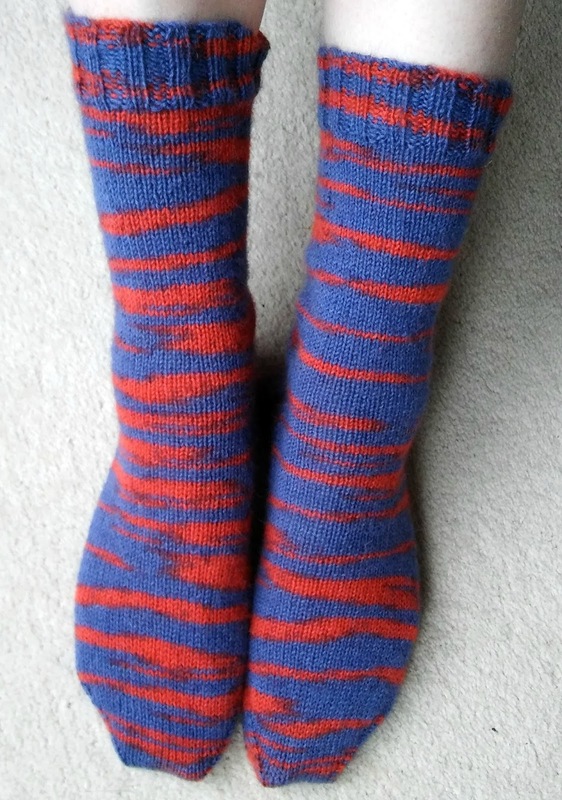 I'm very pleased to have them finished now - it's always lovely to have a new pair of socks to wear! The yarn is Zoofari by Regia in shade Zebra Paul (05866). I do like these zebra stripes, and it's good to know that if I ever meet a herd of blue and red zebras then I will blend in nicely. 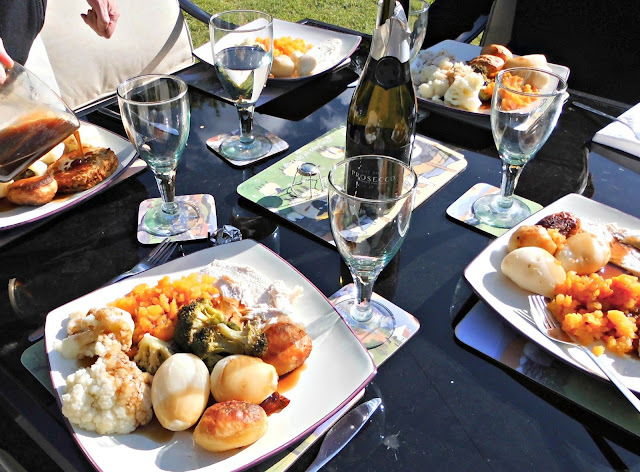 Thanks to Amy at Love Made My Home for hosting Five on Friday, do take a look at some of the other posts! 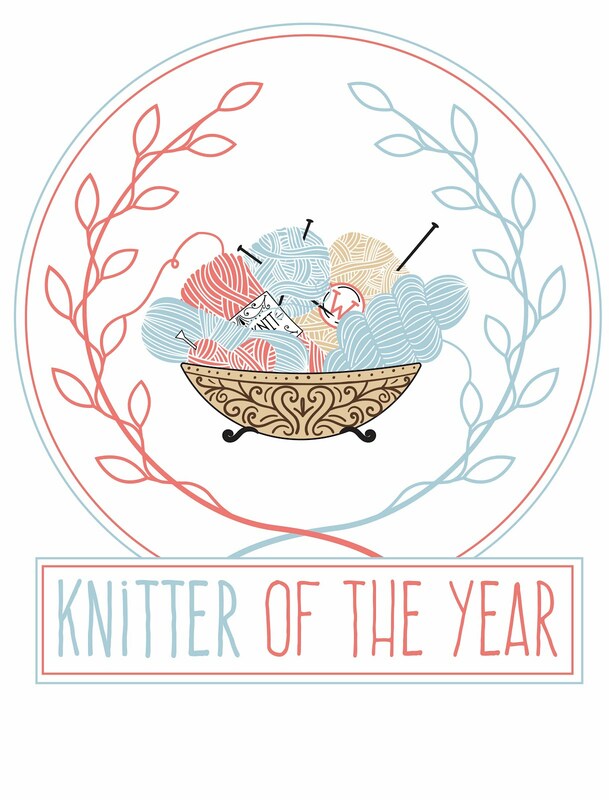 Look out for my next post - an exciting new Fyberspates pattern book giveaway! This week, big daughter and I have been visiting universities. It's exciting and a little bit sad at the same time as I know that when she goes next year, that's the first of my babies flying the nest. We've been to three universities so far, with another few to visit so that big daughter is able to make her application to five of them in January. 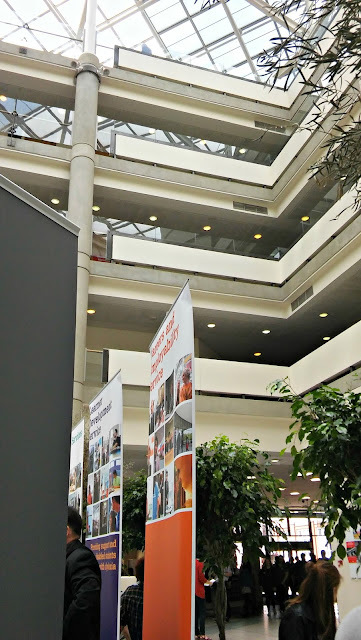 It's been an interesting experience for a variety of reasons, not least as it is an achievement in sales and marketing for each of the universities that we've visited. 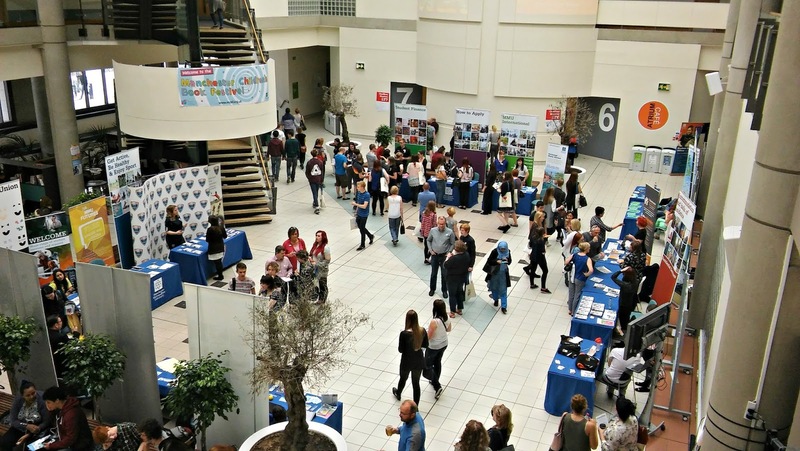 Students are their lifeblood, after all, and the money that they bring is essential to keeping their resources and teaching current, and providing places where students want to live and study. I can't even begin to guess how much money has been spent on prospectuses, course guides and information leaflets. We've been given free pens, packets of coloured stickers, notebooks and - surprisingly - a frisbee. 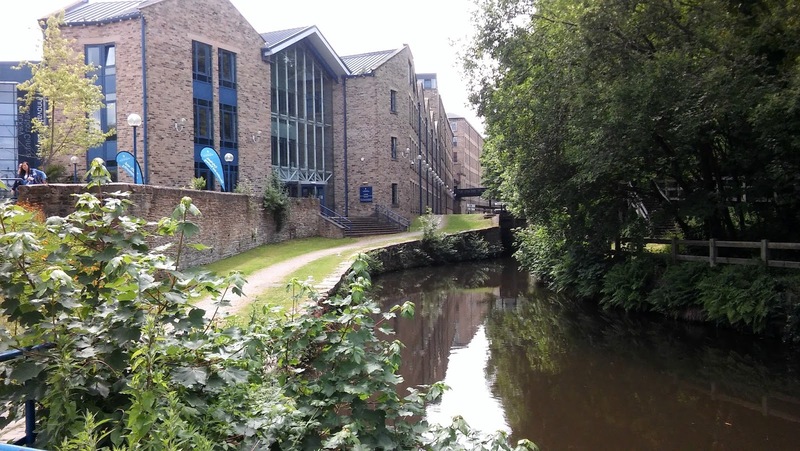 We've spoken to countless people about courses, accommodation, finance, international study options and what it's like to actually study at the university we were visiting. No question has been left unanswered. 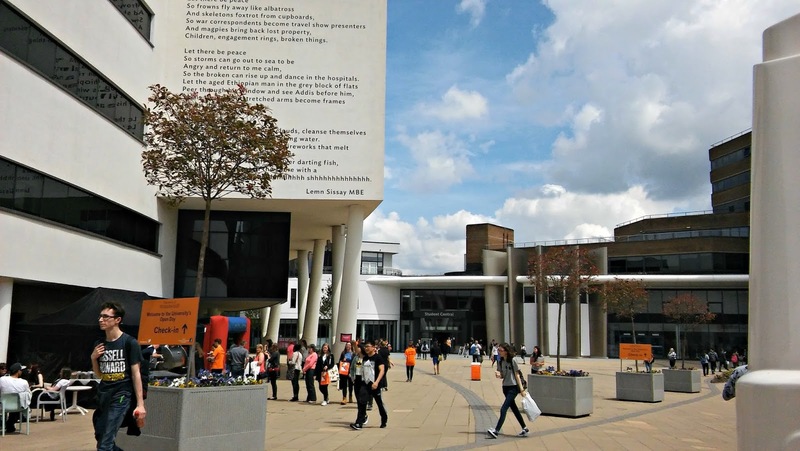 University buildings themselves are showcases of modern architecture. 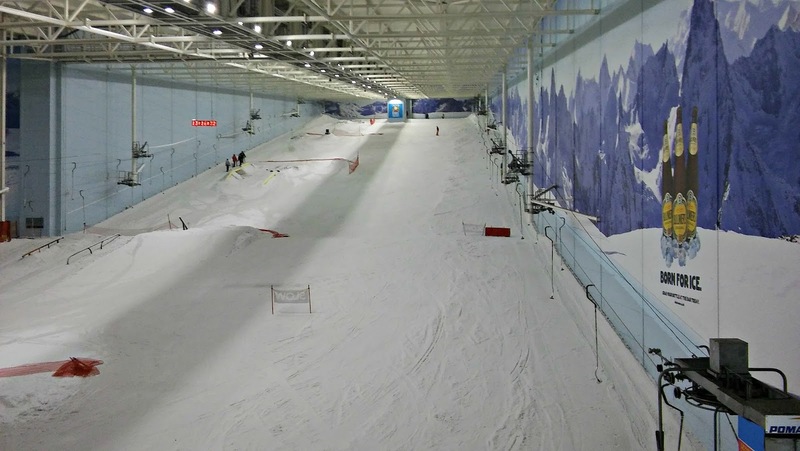 One brand new building we saw cost over £100 million pounds to build. £100 million pounds! That's an unbelievable amount of money, and it's invested in educating the world's future influencers in the best possible environment. No wonder no expense is spared to encourage students to choose a university; such an investment cannot be allowed to go to waste. 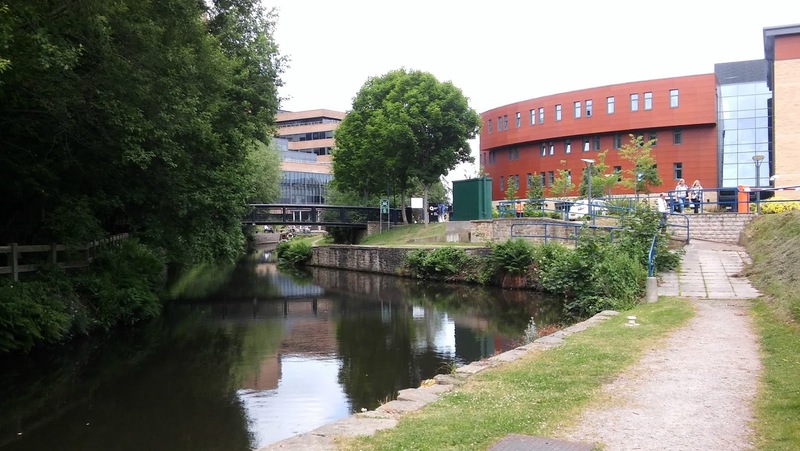 We saw universities in cities and in a more rural setting. We saw faculty buildings from the newly built to the newly refurbished to the untouched for many years. We marvelled at the amount of technology involved in studying these days. We dodged traffic and pedestrians on bustling streets, and strolled by canals between campus buildings. It's certainly been an eye-opener. 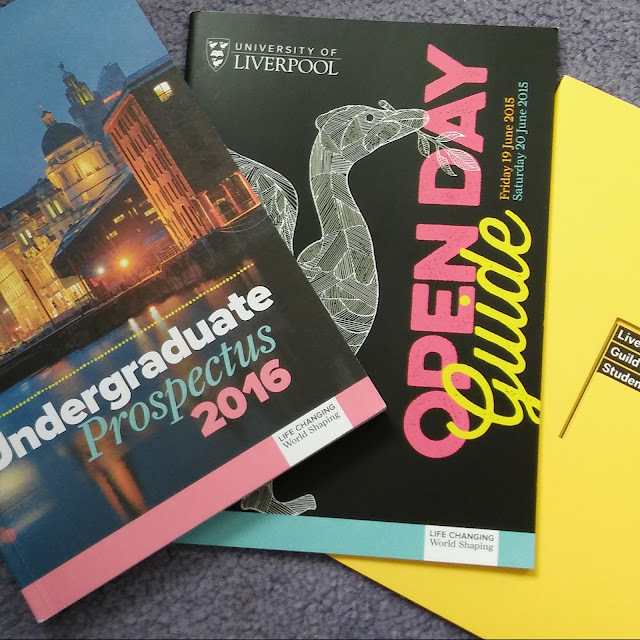 Big daughter is slightly closer to choosing the order of her applications, but we'll need to wait until later in the year now to finish off our visits - and the next few visits might throw her list completely! I've been a bit short on knitting time just recently with one thing and another, but managed to get a couple of rows in whilst waiting to pick big daughter up from college ready for our university visit today. I'm just starting the heel on my husband's sock, and am glad to be changing the colour! It's been great to spend so much time with big daughter and listen to her start making decisions that are going to have such an impact on the rest of her life. It is a strong reminder that she is growing up and is starting to become an independent young woman rather than a child. But I'm glad that she's not too independent just yet. 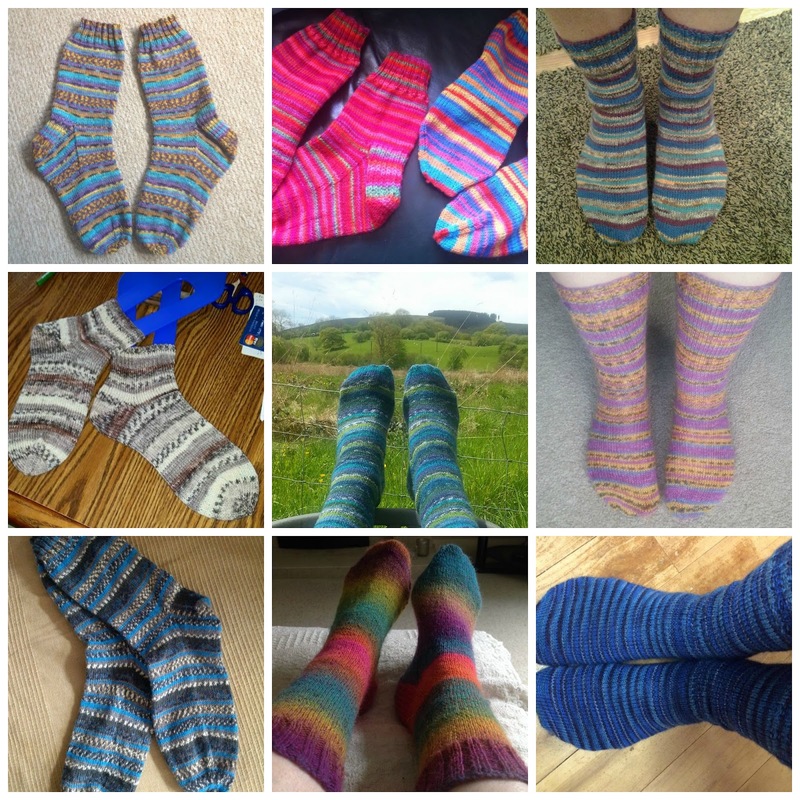 Ever since I've been knitting socks, the reaction from people who've seen them has generally been "Why would you want to knit them when you can buy them?" or "Wow, I wish I could knit a pair of socks!" I usually just smile at the people who ask me "why bother?" and assume that they are not a crafter of any description or they wouldn't need to ask that question - any more than you need to me to explain why not! To the ones who say, "I wish I could do that", I always tell them that they can, and then watch them shake their heads in disbelief. "I don't think so, they're too hard," they tell me. 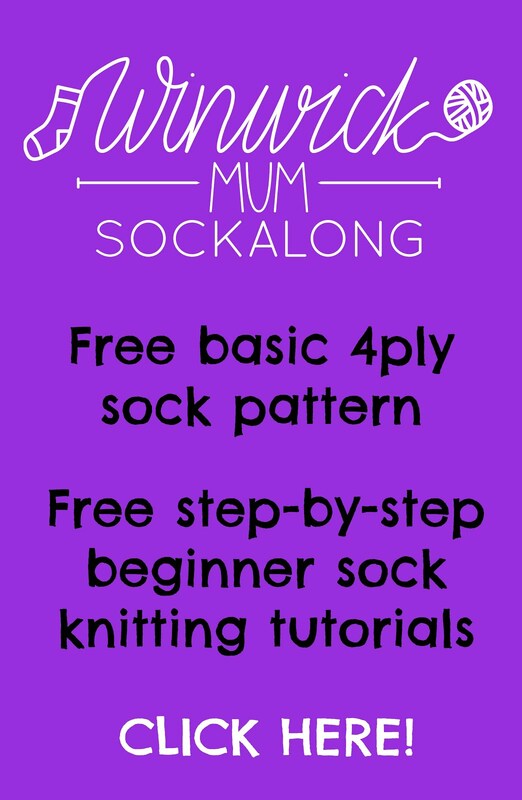 I was convinced that I could do something about this, so back in January of this year, I had the idea that I would create some free tutorials to help anyone who wanted to learn to knit a pair of socks. 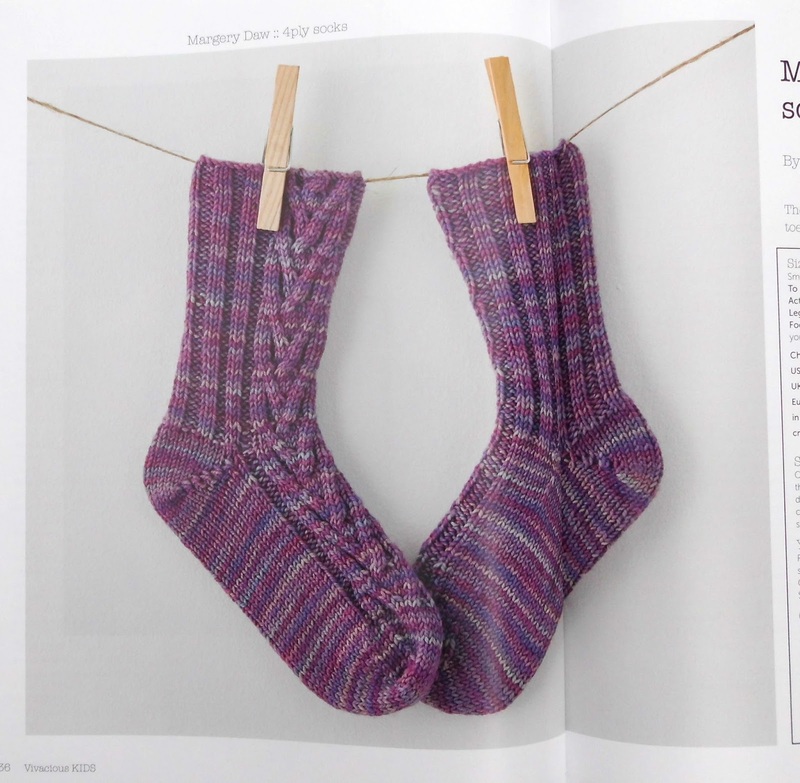 I don't believe that the skills required to make a pair of socks are beyond anyone who can cast on, knit and purl - and thanks to my training background, I was sure that I could create tutorials that anyone could follow. Just one sock at first, followed by the other. No complicated patterns, no two-at-at-time knitting gymnastics; just a plain and simple basic sock. 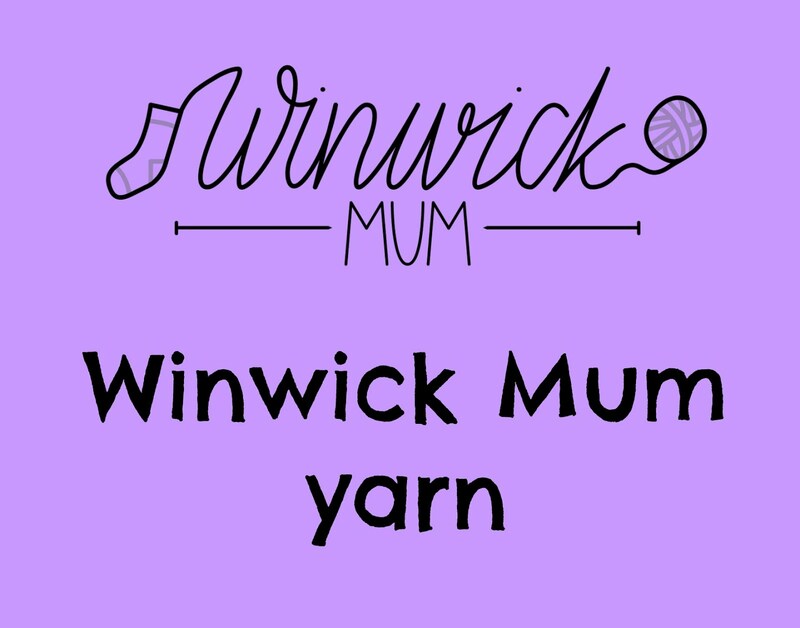 It's now about six weeks since the first Winwick Mum Sockalong tutorial went out on the blog and what an amazing six weeks it has been! I thought it would be great if maybe even thirty people joined in - but thanks to Lucy's Facebook post a few days before the first tutorial, there have been a few more than that! 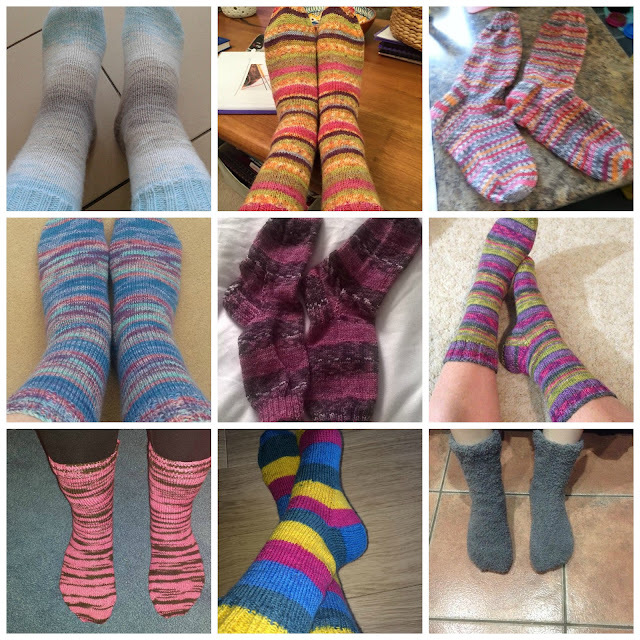 It's been quite incredible to see the number of people visiting the Sockalong pages, so thank you everybody for dropping by, and I've been quite overwhelmed by how the Facebook and Ravelry groups have taken off. 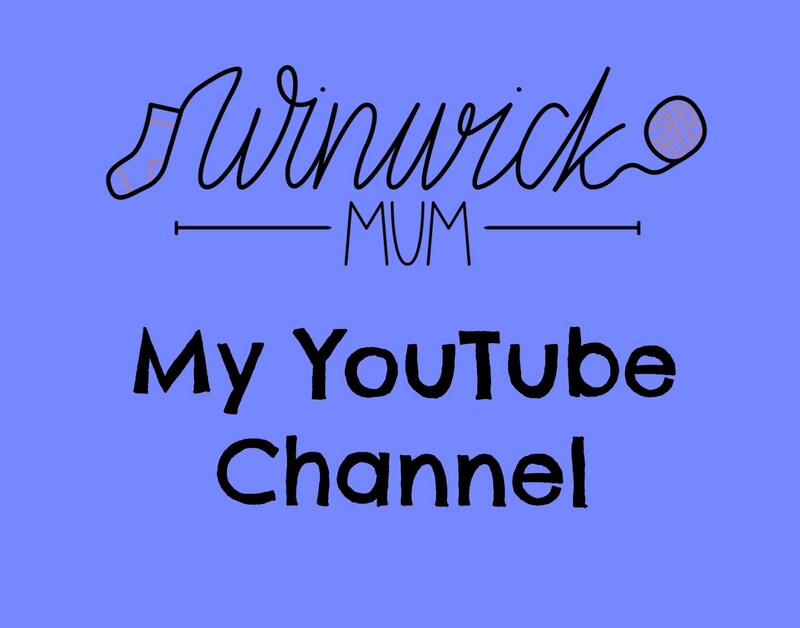 I have to say, it was quite an education, that first weekend of the tutorial and the Winwick Mum Sockalong Facebook group! So many people joining in (over 500 that first weekend!) and asking questions, sharing pictures of their yarn and getting to know each other. I hurtled from one post to another, alternately amazed at the conversations taking place about my sock pattern and panicking that I would miss someone's query. I started to wonder whether any of these people ever went to sleep ... and then I realised that these conversations were taking place from all over the world. Of course people went to sleep - but in their own time zone! It brought a lump to my throat, I can tell you! 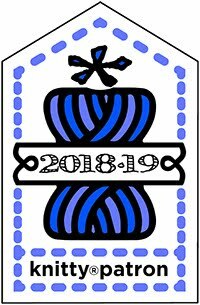 People from so many different countries who had always wanted to knit a sock and had never managed it before - but were sure that this time would be different. Then the pairs started to arrive. 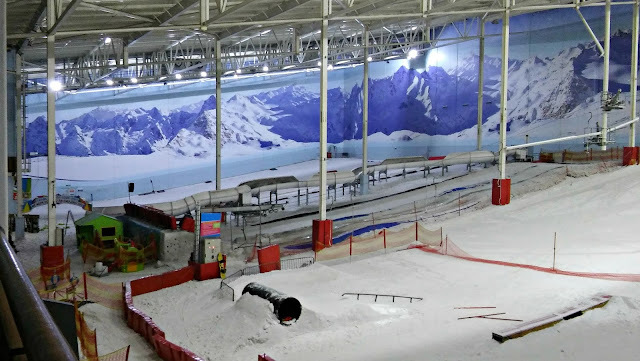 One after the other, faster and faster like falling snowflakes. Almost every hour it seemed that there was another pair to be admired - and the wonderful thing about this group is the sense of community that has developed. Everyone helps, everyone encourages and praises. It really is social media at its best. And do you know, out of all the pairs that have been made (and this is only a small selection! 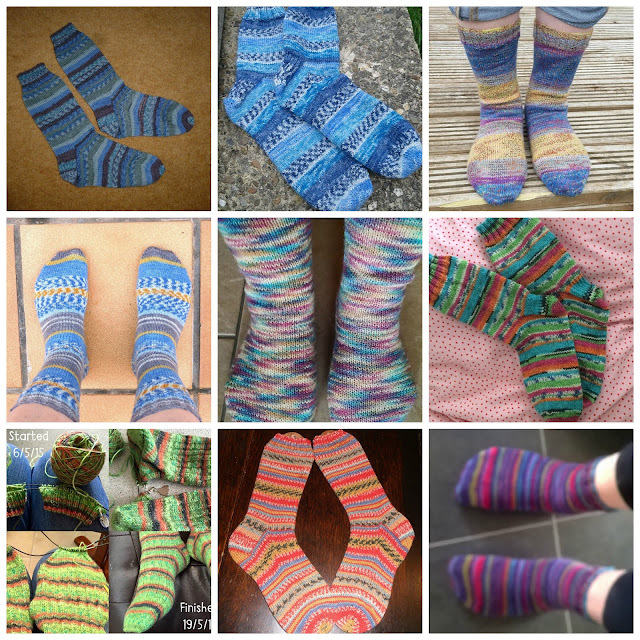 ), there have been very few pairs initially made in the same colour yarn. Thanks to lots of information swapping, I think there are going to be quite a few more pairs of socks in the same yarn as another pair - but the beauty of hand knits is that each sock will turn out differently, even if the yarn is the same. They really are like snowflakes; each one unique and beautiful in their own particular way. 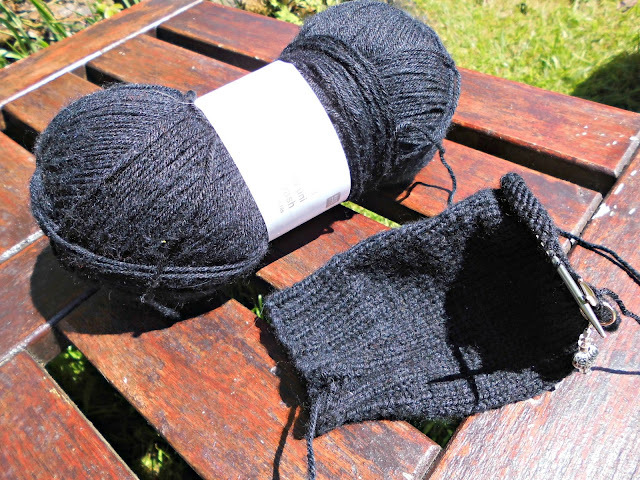 People who thought they would never knit a pair of socks are now on their second, third and fourth pairs. 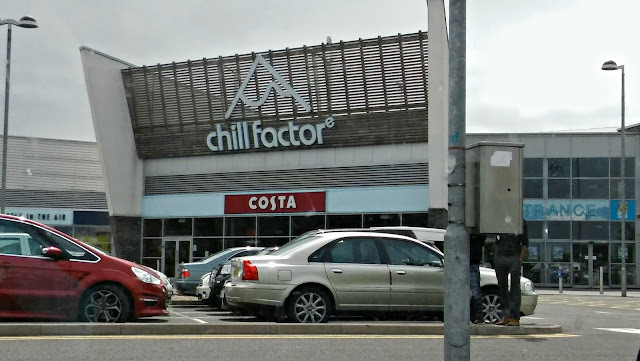 Friendships have been made across the globe and meet-ups are planned. 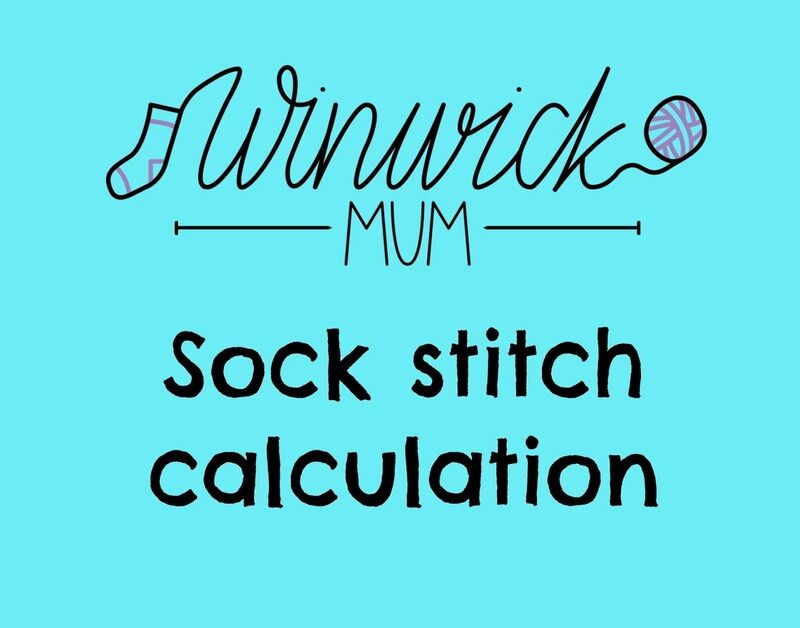 We've started a knit n natter group - the Winwick Mum Sockalong Society - because people wanted to talk about more than just socks. So what now? Well, the Sockalong is far from over. New people are joining in all the time and are more than welcome. 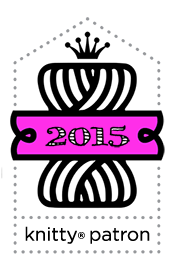 The tutorials will always be on the blog so there's no rush and no time limit. I'm always happy to answer questions, whether here on the blog or in the Facebook or Ravelry groups. 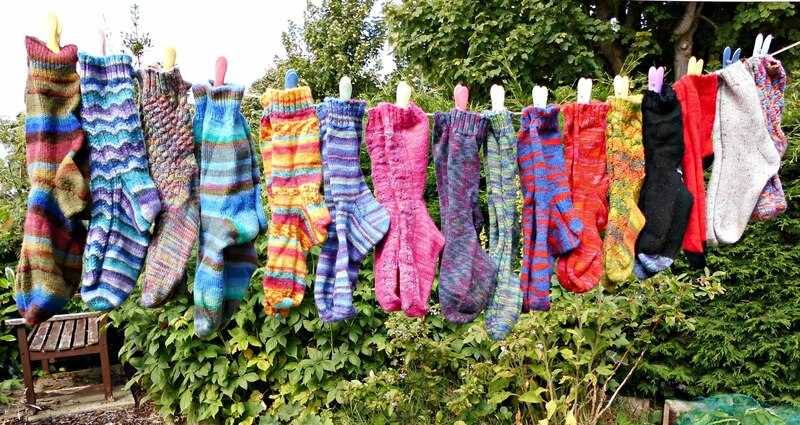 I love seeing people discover that knitting socks isn't beyond them after all. I'm also working hard on a book and Kindle version of the Sockalong because not everyone wants to be online all the time. I'm hoping it won't be much longer before there's some progress that I can show you; so far it's all on the computer which isn't very exciting to photograph! 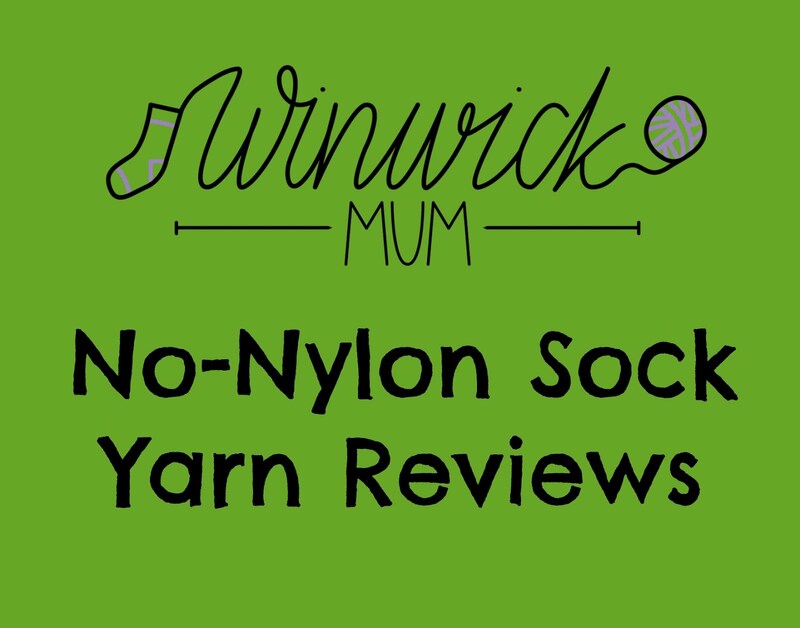 Lucy has very kindly said that she would welcome a Winwick Mum Sockalong meet-up in the Knit n Natter Lounge at Yarndale this year which I think would be a lovely idea - it would be wonderful to see some of the socks in the flesh - er - yarn! (Plus, it's an ideal opportunity to stock up on even more sock yarn!) 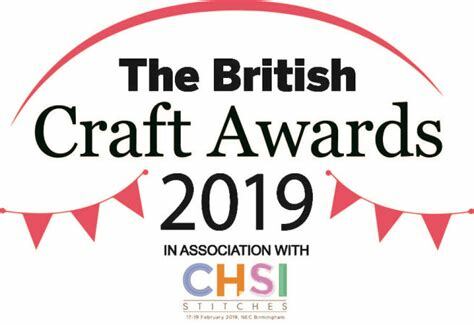 She even said there would be a place to string up sock bunting if we felt inspired to create some so I'd welcome your thoughts on that. Yes, it's all very different from this time six weeks ago - wonderfully different and very exciting! I can't tell you how fantastic it feels to know that my little blog has been a catalyst for some new sock obsessives (over 840 of them in the Facebook group now, and over 170 in the Ravelry group - plus however many of you out there in blogland - it's no wonder some of the yarn stores have been selling out of sock yarn and needles!) and that so many people now have a new project to occupy their hands and minds and fill their wellbeing tanks. Thank you. Thank you everybody. We bought a new garden table and chairs last weekend. Our old wooden ones, having lasted for the best part of ten years, finally gave up the ghost over the winter and aren't fit for very much at all any more. So when my husband spotted this new glass table and four very comfy chairs, we decided that the time had come to buy something more substantial to sit on. We are terribly pleased with them - not least because our purchase seemed to come with the addition of free sunshine so we've been making the most of it! and no, small daughter didn't have any despite the glass. This is her tipple - tap water with a parasol (of course!) - but she does like to have a glass the same as everyone else's. Monday morning came and the sun was still shining - hooray! 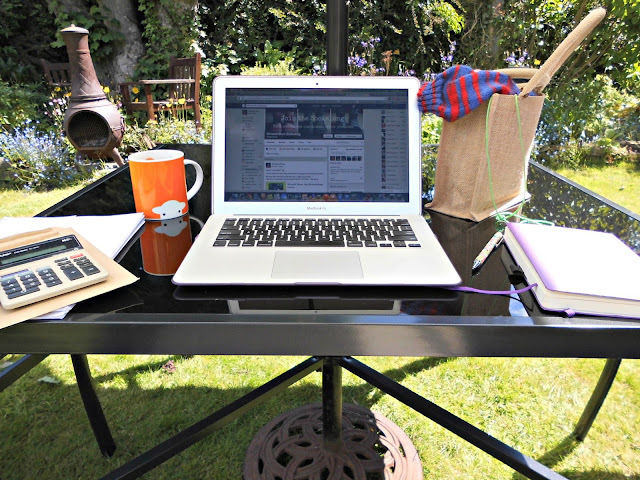 I set up my office outdoors, ready to tackle receipts and expenses from my husband's business, the weekly menu in my bullet journal and a just a few rounds of sock knitting. I think all offices should encourage knitting because of the beneficial effects on the knitter's state of mind - unfortunately, though, I'm not sure exactly how much other work would actually get done! 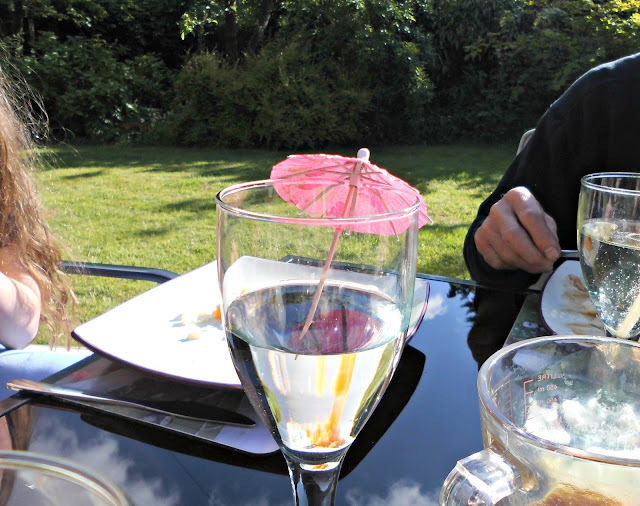 I took my lunch outside today as well - ham salad on pitta bread with coleslaw. I've taken quite a fancy to pitta bread stuffed with various fillings recently - it seems so much more exciting than plain old sandwich bread. I've no idea how long this nice weather is going to last for so I'm trying to spend as much time outside as I can. This little wooden table is just about all that's left of our old garden furniture and is just the right height to put your feet up on whilst you get into the knitting groove. I thought you'd rather look at my nearly-finished socks than my feet, though J. If you think you've seen the sock yarn before then you're absolutely right - I started making these socks back in March when I went to the Yarn in the Barn knit n natter at Black Sheep Wools. Yes, it has taken me rather a long time to finish them off, but I've had a couple of other things on the go recently ... not least of which is a Sockalong! I'm still quite stunned with how the Sockalong has grown ... it's not so easy to tell from the blog quite how many people are joining in (apart from my page visit statistics which are regularly causing my jaw to drop) and the lovely comments that people are leaving, but the Ravelry group now has over 170 members and the Facebook group has over 800 members. That's an awful lot of socks! 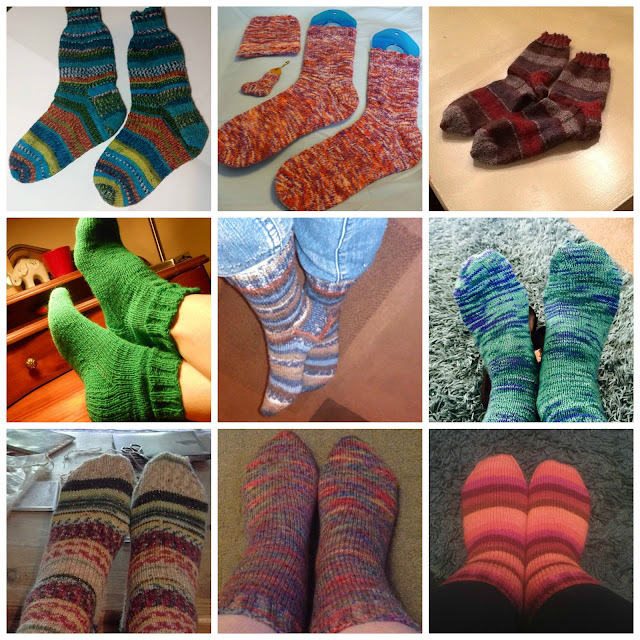 One of the best things about the Sockalong for me is the number of people who thought they could never knit socks but then just a few weeks later they're modelling a stunning pair of their very own. It makes me so happy, I can feel the pride and joy across the internet - and across the world as we've got socks being created from Australia to America and lots of places in between. I'd like to tell you more about it and show off some of those pairs of new socks, so I'll write about that soon. 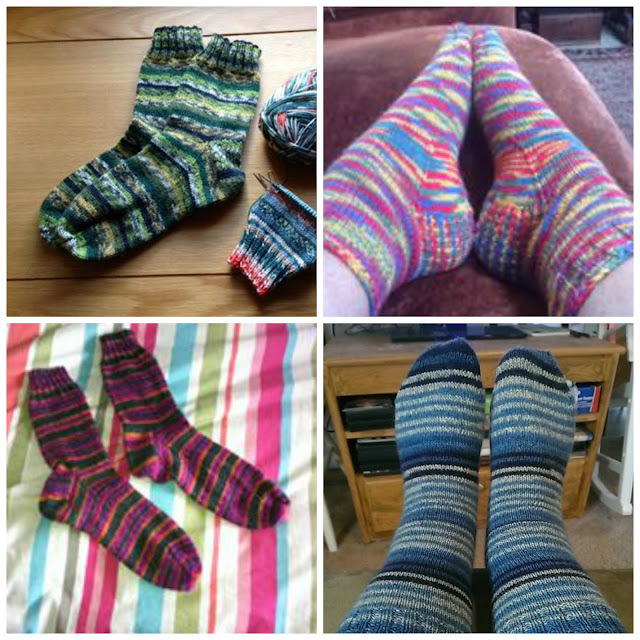 It's not too late to join in if you'd like to learn how to knit a pair of socks as it's an ongoing Sockalong with new people finding us all the time. It's designed for beginners with step-by-step pictures and best of all - it's free! You can find all the tutorial posts and the pattern link here. These socks are knitted to the basic 4ply sock pattern that we're using for the Sockalong. I know this pattern so well now that it feels like coming home just to sit and knit, not worrying about whether they will fit me or not, just enjoying the way the stripes are knitting up (these are blue and red zebra stripes, apparently - because you never know when you might need to blend in with a herd of blue and red zebras) and enjoying the process. 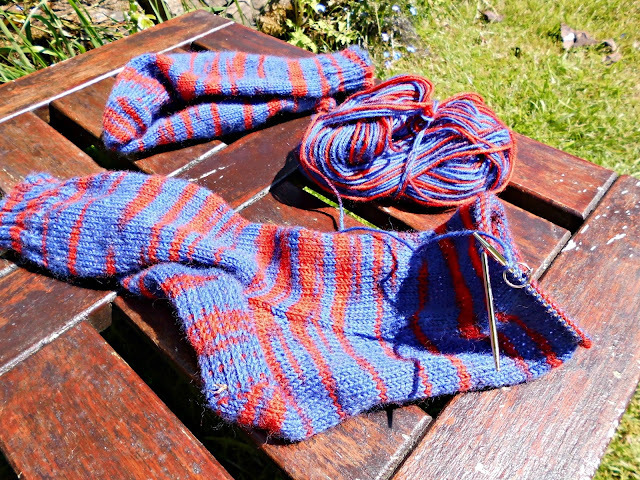 They're nearly finished now - just the toes to do on this second sock. 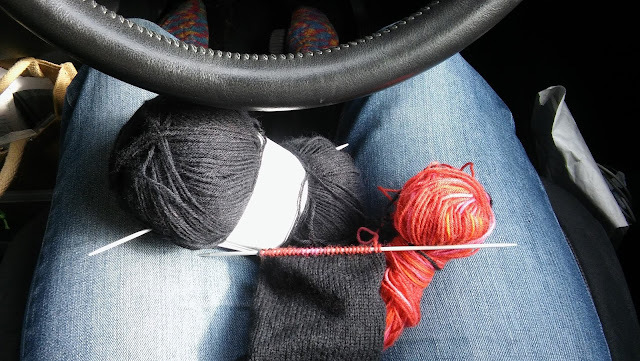 I'm still not very good at just doing one thing at a time, so here's my other pair of socks which I've got on the go. I bought this yarn from Black Sheep Wools when I was at the knit n natter; it's Superba Bamboo Uni Superwash 4ply, a mix of virgin wool, polyamide and viscose. I've never used it before but my husband is in need of some new socks and his preference is always for black socks with coloured heels as toes. It'll be interesting to see how it compares to the wool yarn that I've used for his socks before and whether they are any more comfortable over the summer as I know that sometimes his feet get a bit hot in his wool socks. I use a short row heel rather than a heel flap for these ones, and I'll be writing up a tutorial later on in the year in case you'd like to try for yourselves. I've been trying to master a new knitting technique with this particular pair of socks - Russian knitting, which as far as I can work out is very similar to Norwegian knitting, and not that different from Continental knitting. It basically involves holding your working yarn in your left hand rather than your right hand as you would do for English knitting and is supposed to be much faster. I like the sound of this as it implies that I can knit more pairs of socks, but the reality at the moment is that it isn't the case at all! I'm also trying out a 9" circular needle to see how it compares to my usual 12" needle. Like any new skill, I'm finding that I have to concentrate and watch what I'm doing much more closely than usual. My hands are in a different position and that makes them ache after a while - but every now and again I have a burst of speed and can see the potential which makes it all worth while. 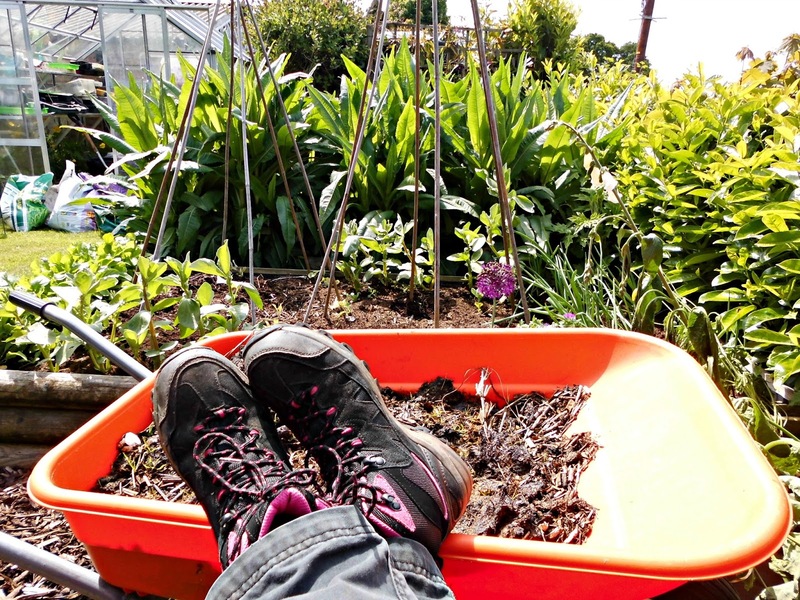 Simply add a comfy chair in the sunshine, something to put your feet up on and a background soundtrack of birds and bees, and that sounds like a lovely summer afternoon to me! 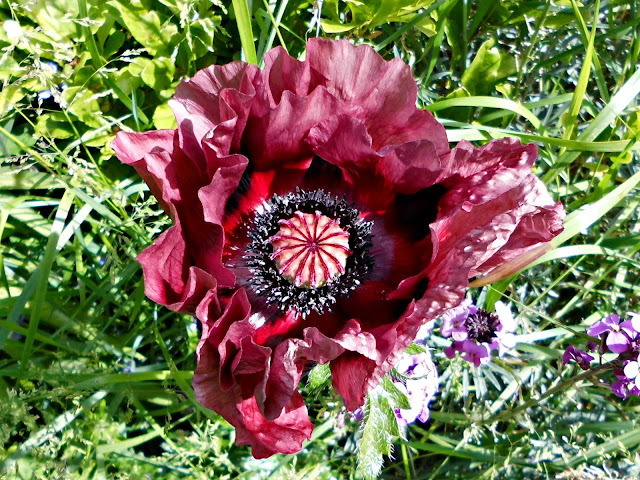 Every year, without fail, there comes a time in my garden when things are growing faster than I can keep up with them. Despite all my good intentions of staying one step ahead this year (even with having a dedicated Garden Day which has helped enormously), that time is fast approaching and the gap between me being totally on top of the garden and the garden doing it's own thing unchecked is rapidly closing. 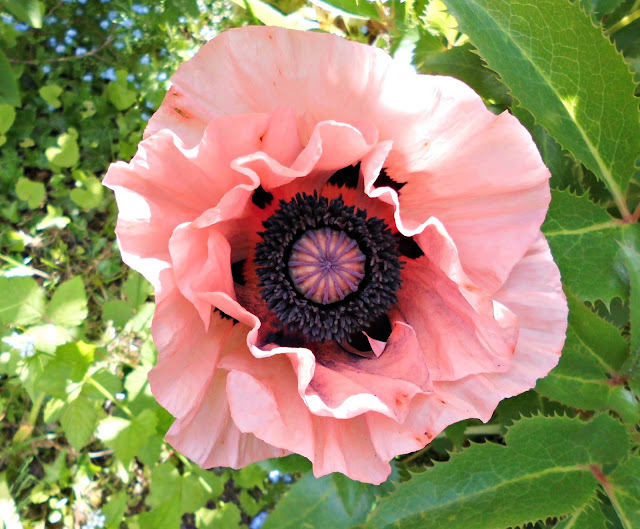 I've been spending my time focussing on flowers and seedlings, and taking my eye off the veg patch for even a short while now seems like a bit of mistake. Take the teasels, for example. Only a couple of weeks ago they were still a manageable size in raised vegetable bed where they had taken up unofficial residence. No, of course I didn't get round to moving them whilst they were still quite small - and look at them now! 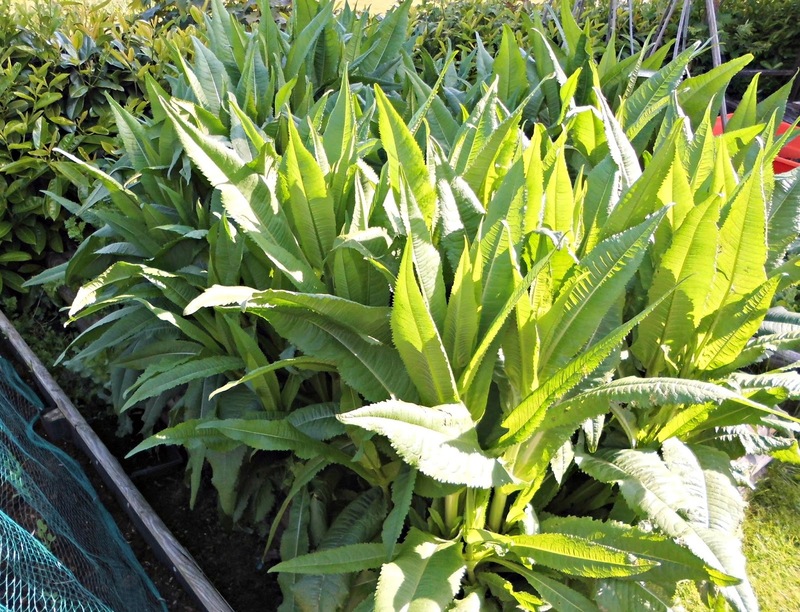 They're not far off triffid sized! I'm torn between trying to move them anyway and risking that they might die because they're too big (although this means that I won't be able to plant any veg where they are) or leaving them until they have flowered and then shifting them (which will mean that it's a bit late for planting what I had in mind for that bed). It's a tough decision, and the longer I leave it, the more likely that I won't have any say in the matter at all! I'm almost ashamed to show you this picture. 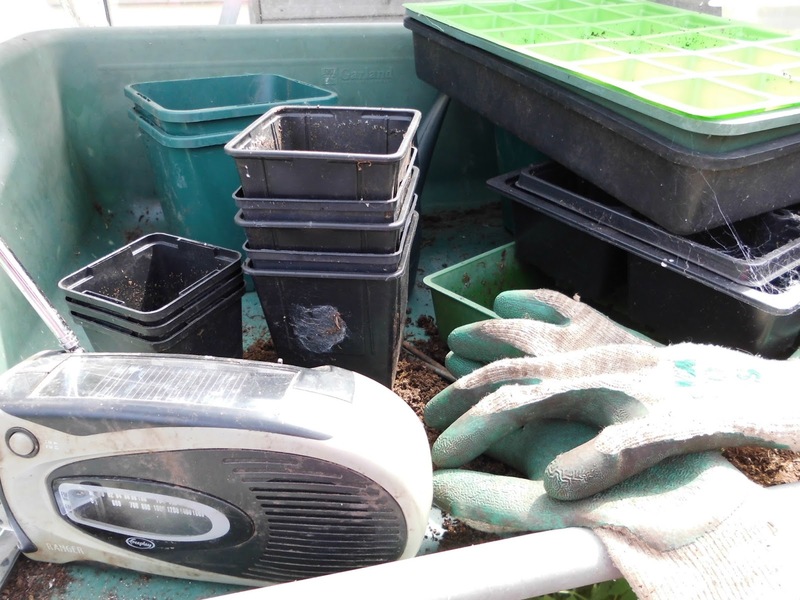 This was my greenhouse until Thursday of this week (Thursday is Garden Day, if you remember!) and it's not very impressive. 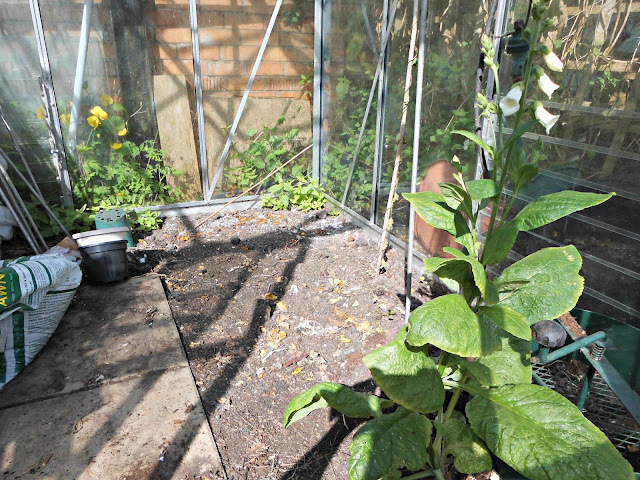 The beautiful white Foxglove (Digitalis purpurea) is, but it's not supposed to be there - right where my cucumber plant needs to go. This is where I always wish I was a bit more hard-hearted about flowers, like my Dad is. He's a veg grower through and through and takes no prisoners where trespassing flowers are concerned. That Foxglove would have been out of the greenhouse before you could say "Jack Robinson". In fact, the Foxglove wouldn't even have got to grow in his greenhouse in the first place. But me - well, I love Foxgloves. I love their long bell-shaped flowers and the echoey noise that the bees make as they buzz up inside them. 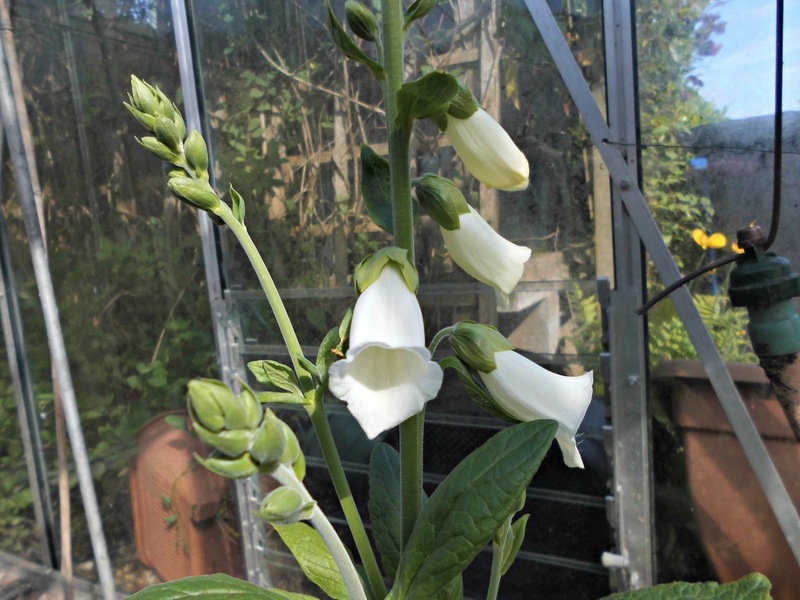 I particularly love white Foxgloves so instead of whipping it out and flinging it into the compost bin, I very carefully dug it up and re-homed it to where I can see it whilst I'm sitting in the garden. 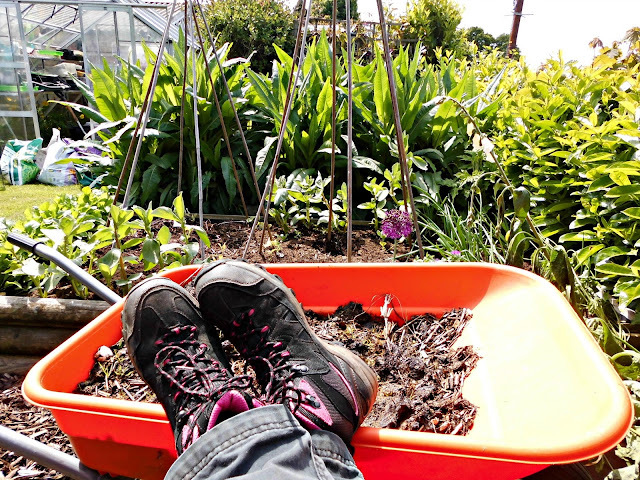 I'm not good at sitting in the garden - like most gardeners, I expect, I spend more time looking around at what I should be working on rather than just enjoying the moment, but I am trying hard to get better at it. Here are some more flowers that shouldn't be growing in my greenhouse but are fragrantly flouting the rules. 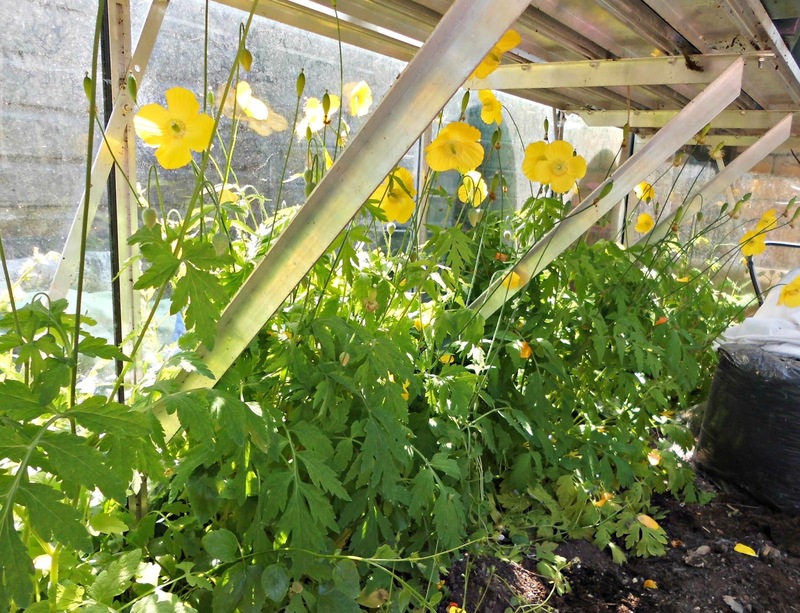 Welsh poppies (Meconopsis cambrica) have invaded and are happily nodding their heads in the sunshine. They need to be evicted but unfortunately, like Foxgloves, poppies don't like to have their roots disturbed and whilst the Foxglove has survived the move, I know that the poppies probably won't. I can work around them for now and I'll lift them as soon as the flowers are over so that the seed heads don't form. And I'm learning to be just as happy when I'm not pottering and I'm just sitting. Sitting and surveying the greenery, listening to the house martins chattering to each other as they swoop and skim, and the bees buzzing about. Sitting and enjoying the warmth of the sunshine on my face. Sitting and, just for the moment, having nothing else in the world that I need to do. Elsewhere in the garden, the blackcurrants are growing steadily on the bushes. 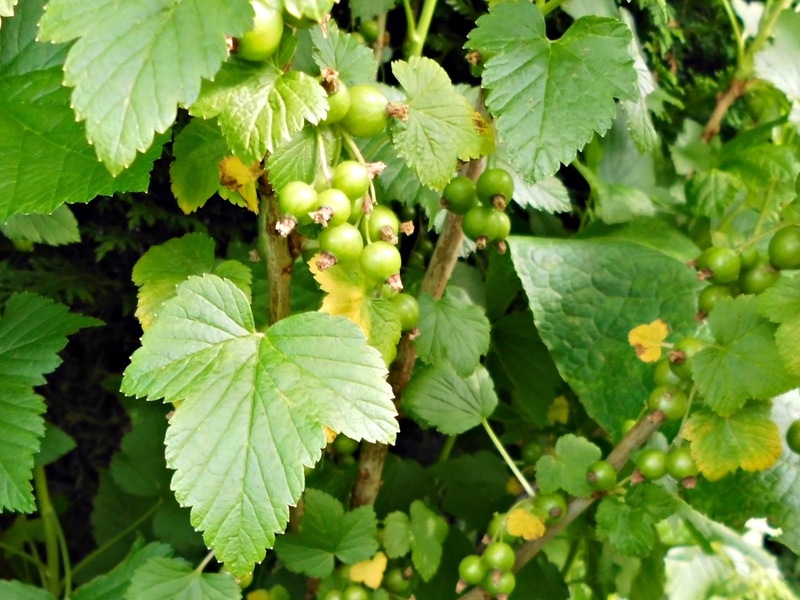 These blackcurrants will eventually become jam - no one in the house is that keen on blackcurrants in their proper form. They'll be joined by the raspberries which are also growing nicely but won't be ready until the autumn (I grow the variety called "Autumn Bliss"), although not the strawberries which small daughter will attempt to polish off single-handedly. It's a funny thing, but I don't actually like eating berries - it's something to do with the texture when I put them in my mouth and the little seeds - but I love berry-flavoured foods. Strangely, though, I don't mind blueberries. Apparently this is quite common amongst people who aren't keen on berries because there are no seeds. I can eat berries if I have to - sometimes we've been out for a meal and someone has gone to a great deal of trouble to make a berry-filled pudding and I would never hurt their feelings by refusing to eat it - but I don't make a habit of it. What I do like eating very much is our own home-grown tomatoes, especially when they're straight out of the greenhouse and still warm from the sun. Ooh, I don't just like them - I LOVE them! 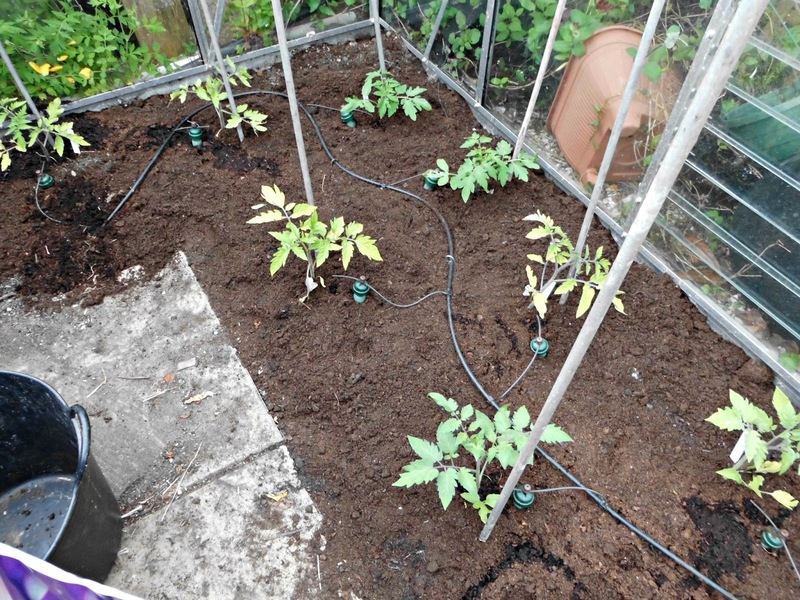 My greenhouse is looking much more fit-for-purpose now and the plants you can see will soon be producing beautiful red tomatoes. We try to eat as many of them raw as we can so that I'm not left with tons of them to try to create puree with, but whilst on holiday in Canada last year my cousin made a wonderful tomato pasta dish that I'm definitely going to try this year - I've been waiting specially until we can use our own tomatoes again! Next time, I'll show you how the flowers are getting on. 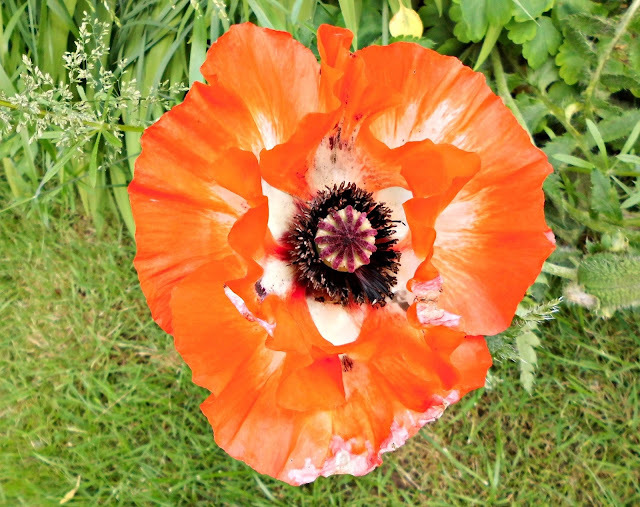 My garden is very definitely a Spring and early Summer garden so there's plenty to see at the moment. How is your garden growing?